EDIT: I'll attempt to keep this 1st post factual and update it with info. The replies in the threads however tell a very sad story about the companies behind this product. Posting for awareness after my VPP755 in use for 7 days fell victim to the same type of noise as in the videos below. They are all from folks whose VPP755 pump got noisy after a while. It looked like a promising pump on paper, which was initially silent even at 3500 rpm in my case (with a Watercool Heatkiller D5 top). https://youtu.be/_X2GzT7nj8U (this is mine, note that it's sitting on a thick sponge, completely decoupled from the case; fan noise for comparison before switching on the pump; noise is the same regardless of the o-ring used). Here: customer reported his warranty was refused because they used Mayhem biocide. Here and here: customer reported threats from Alphacool after posting an email showing Alphacool refusing warranty, and photos made by Alphacool (I witnessed said post). Here: 3 failed pumps due to noise, Alphacool asked customer to not post publicly about it. Their online shop (here, screenshot) claims that using Mayhems fluids voids warranty of many brands. Here: they changed the conditions for warranty, now claiming that all pastel coolants void warranty. This was not a warranty condition included with the shipped product. I and others can confirm that, see here. As confirmed by reviews here and here, they initially claimed the pump is compatible with all D5 tops, then changed that claim to all "current" D5 tops. However, the said reviews showed that it leaks with some current D5 tops or is incompatible with some current D5 tops. I confronted them about this here but received no response. As of March 1 they stopped replying in this thread or on PM, despite initially asking me to PM them. Mayhems responded here and here, strongly refuting the above claims, and ceasing to supply Alphacool / Aqua Tuning with Mayhems fluids. Indeed, most watercooling enthusiasts, myself included and others in this very thread, can confirm that Mayhems coolants are among the best and have not damaged any parts (NB: All EKWB coolants, clear and pastel, have been made by Mayhems, confirmed here). Note that the Aurora product from Mayhems is different and excluded, and Mayhems has always been crystal clear about it being meant for photo display only, and not for normal cooling use! The users in this thread who were refused warranty for using Mayhems fluids did not use Aurora. Watercool responded here, also refuting the above claims from Alphacool / Aqua Tuning. EKWB responded here also refuting the above claims from Alphacool / Aqua Tuning. Aquacomputer also responded here and here, but their reply is not very clear with regards to the above claims. Mayhems responded again here, refuting further claims from Alphacool / Aqua Tuning, and showing proof of conversation with PR rep from Alphacool / Aqua Tuning, where the latter confirmed they are not a chemist and did not check if their claims regarding damaging fluids are correct or not! Mayhems also highlighted US and European laws that make it problematic for Alphacool / Aqua Tuning to refuse warranty. These German companies seem confounded and run by the same people. The following Overclock.net users are reps of these companies: AT-Nathanael (apparently CEO), AT-Eduard (apparently head of customer support Germany), AT-Pascal (apparently head of customer support UK), AT-Andi (I don't know his/her role). Nathanael Draht appears as CEO of Aqua Tuning (ToS, screenshot) and replies by Alphacool place him as "boss" at Alphacool too. Youtube videos (e.g. 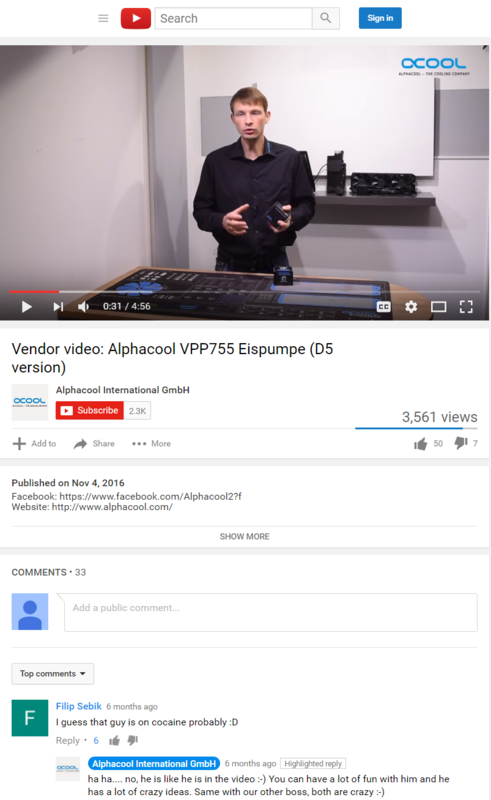 here, screenshot) show Nathanael introducing himself as "Nathanael from Alphacool", and a reply by an Alphacool employee state he's "boss" there, see here (screeenshot). The Alphacool thread (screenshot) on OCN also places him at Alphacool. Phobya seems to be part of Aqua Tuning entirely. 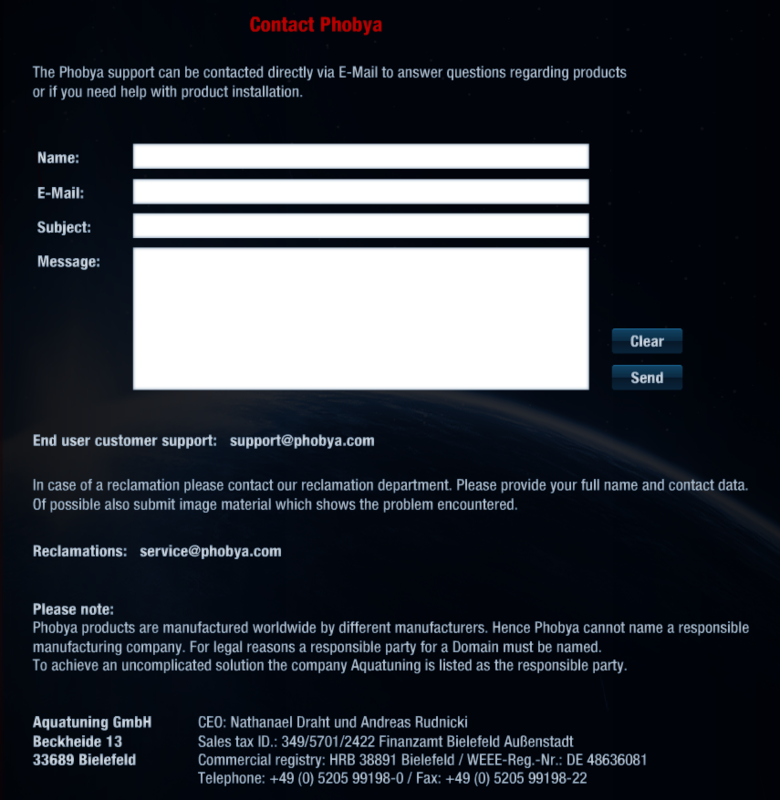 See phobya.com > About (screenshot). The Aqua Tuning ToS is a little scary too (see comments here). In 2009 there were reports (here, here) of Aqua Tuning using unfair market practices to lock out its competitors by re-registering its competitors' company names and then even serving its competitors with cease and desist orders. Details on TechPowerUP here. A reply to that article from an Alphacool rep (see here) claims Alphacool and Aqua Tuning were completely separate and independent companies who don't share leadership. I was unable to verify if this was true at that time (current evidence shows it's untrue at present). More recently, in their shop and in this thread as well (see links in CLAIMS above), Aqua Tuning / Alphacool have accused Mayhems coolants of being harmful towards watercooling parts, stating that their coolants contain a number of harmful chemicals. The accusations have been debunked by Mayhems several times (see RESPONSE section above) who clarified that no such chemicals are found in their products. It must be said that Mayhems coolants are very popular and well known in the community and have been successfully used by enthusiasts for many years (myself included). Lately reports surfaced that Alphacool will launch their own coolant. These reports corroborate the attitude towards competitor products and 2009 market practices accusations. The Reddit thread also contains comments about the washer (comment). 2017-02-26: RMA opened at Aqua Tuning. 2017-03-06: RMA not going that great, see here. I was asked for video evidence (!). 2017-03-10: More progress on my RMA here. I was allowed to send it back. They conditioned the refund on reproducing the fault. 2017-03-18: Pump sent back to Germany. I pointed out that I opened this thread on OCN. 2017-04-04: Full refund received, more here. My VPP755 developed the same issue after some months now (still kinda silent on 1 though), however this has not been fixed with the V2...had some V2s here which made that noise straight out of the box. On the RMA I was told, that this happened because I used three drops of Mayhems Biocide with distilled water...go figure, I suppose I'm ending the VPP755 experiment. That's a BS response from Alphacool. I'm using EKWB clear coolant and it's the Rev2 of VPP755, both purchased beginning of Feb.
Alphacool is changed their tune before when confronted with issues. They were confronted about their claim that this pump is compatible with all D5 tops. Reviewers (e.g. here and here) tried it with some D5 tops and found that some don't fit or they leak. Alphacool then adjusted their claim to say all "current" D5 tops. Still, some of the "current" D5 tops still don't fit or leak (see those two links) and Alphacool were confronted again. They then said they tested this pump only with D5 tops from Alphacool, Heatkiller and Aquacomputer. Officially, the claim is still that it's compatible with "all current D5 tops" (see screenshot from Alphacool website taken today), which is isn't true. I'll see what they'll say in my RMA since I have used EKWB coolant and the Heatkiller D5 top (horizontal position etc, pretty much everything is by the book). I have a version 1 that has not been used yet. What should I do? Thanks! I have the exact same combo as you and my pump is about 2 weeks old, I am definitely going to keep an eye on it after reading this thread. Depending on where you live, you should have a grace period (2 weeks?) to return products for a full refund, which is what I would do if I were you - check your country's distance selling regulations and/or the shop's return policy. If it's outside that grace period, then I guess you could test it and if it's noisy or otherwise faulty then you can open an RMA case under warranty with either the shop or Alphacool. Note that the noise may not be audible at first ... in my case it took 7 days. Others reported noise after 1 day (like the guy in the video) while others after some months. YMMV. I guess it also depends on the rpm you run it at, ambient and coolant temp etc. I kept mine mostly at 2800 rpm. There is a reason why you lose your warrenty at a lot of brands if you are using Mayhem liquid. All "current" D5 tops. Laing changed the impeller of their pump in 2011, all tops from all brands had to change their tops. If you are using an old top with a new D5 you will always have problems with leaks and other things. Doesn`t matter if you are using a VPP755 or a brand new D5 from Laing/Loward. If you have some issues with with the VPP755 start an RMA. Until now, we got only 5 VPP755 pumps back, one had a problem with the knob and the other 4 was damaged by the customers. They put the impeller out. We can`t retrace wich kind of problems you guys have, if we didn`t get the pumps back. We have to check them. I noticed the warning on aquatunings site about mayhems and loss of warranty with certain brands. Can you tell me why this is? Because Mayhems is using glysantin or sometimes glycerin for their liquids an both attacks any kind of plastik (Acetal, Plexi, PVC.... ). Thats the reason why a lot of brands gives no warrenty on their products if you use Mayhem.